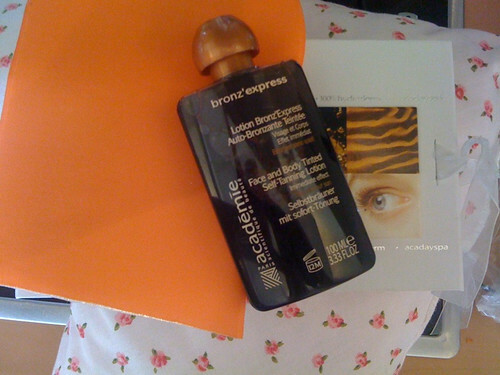 If you read my last post you know that I was doing some late night tanning with Academie Bronze’Express. You can have a read of that post to see what my initial thoughts were based on packaging, consistency and scent. The lovely scent that was there on application disappeared in the first hour. It was replaced by an extremely subtle scent of fake tan, probably undetectable by most. It dried instantly. Now I know St Moriz and St Tropez mousse dry fast but this is unbelievable. This means you have to work fast which is fine for tan application pro’s but maybe not so great for beginners. It added colour right away so you could apply it in the day time if the scent didn’t bother you and have a hint of tan right away. As I mentioned in last nights post I exfoliated like a mad woman the night previous to application so I had no problems with the tan bonding to dry skin. There are some tans that are more forgiving if you have not exfoliated. This is not one of them. Because of the watery consistency and high speed drying I suspect this would cling to dry bits and look disgraceful when the tan has developed. No streaking. I used a tanning mit to apply the tan. You couldn’t use your hands it would stain them pretty bad. I suspect rubber gloves but be challenging too. A mit is the way to go with this tan. The top of the bottle is small so I had to put some on the mit and do a little bit at a time. This is best to achieve good results but it definitely took longer than smearing myself in St Tropez (but the the drying time is zero – major benefit for me). I applied it to my face, it didn’t irritate at all (the skin on my face does not like tanning products). The colour is not orange at all it’s a light golden colour. My skin looks like it does after a day at the beach. It’s not a deep tan after one application. If you were after a darker colour you would need to apply this two nights in a row. One application is enough for me this time of year. If you like a creamy consistency or time to work a product in then this might not be for you. On the other hand if you are a lady in a rush and desire a faff free application then you may like this. Although this was a thank you gift from TV3 I would buy this in the future. Maybe not for every body tan application but certainly for emergencies. I’m out off by one thing only and that is the need for a near perfect base. I will be using this on my face from now on. It’s available at beauty salons nationwide and Unicare pharmacies for €20.95. The Bronze’Express mit is €5.50 but could use any brand (Penneys do them too).